We returned home from our LDS mission to Chile with a diagnosis of terminal cancer in my husband. This is a story of how we coped and how I have been able to find joy in the journey after his death. Prior to our departure for this mission a Chilean-American friend told us "Santiago is full of beautiful parks, and plenty paths on which to bike, jog, or walk. That's a good thing, as you're going to need them. That's because the food is so good, and they feed you so much of it." Now we understand the reason for his warning. The food is tasty, alright, but not quite world-class cuisine. The portions served in any public eating establishment, however, are always enormous! I am surprised that there are not an awfully lot of overweight people living here. The most striking thing about the Chilean diet is the very large amount of meat they eat. I'm told that worldwide, their per capita consumption is just beneath that of Argentina. Most of it is beef, and most of that is imported from Argentina. On any given afternoon, as we return to our apartment for almuerzo, we whiff the tantalizing smells of beef dishes being prepared by our neighbors as they waft up through the elevator shafts. Chicken, pork and some turkey is consumed, and in the south they eat a lot of lamb. A great deal of inexpensive fresh seafood is available throughout Chile, so large amounts of that are consumed, also. Almost every imaginable mollusk, crustacean, or fin fish is served in restaurants. Ceviche, Perú's national dish, is common here, but not as tasty as I've had it in Perú or Guatemala. To whatever extent Chile has a national dish it is the empanada, meaning "something surrounded by or coated with bread." These are sold, hot and fresh, everywhere. Millions are eaten each day. They are the 'Egg McMuffin' to the breakfast-on-the-run crowd. They are eaten as fast food, as we would a sandwich or hamburger. They are sold in small street corner shops and sidewalk kiosks, as well as in the finest restaurants. Almost anywhere other types of food are sold, you can buy a hot empanada, including McDonalds and KFC. They are usually baked, but sometimes they're deep fried. The crust around them is usually like a folded flatbread, but sometimes it's more flaky, like a croissant. They are almost always filled with meat in a sauce that can include boiled eggs, olives, mushrooms, etc. Another frequent fillng is cheese. Then there are fruit-filled empanadas (pineapple, peach, etc.,) and seafood fillings (usually shrimp, scallops or crab). Here's a photo. The foreign diner here needs to constantly remember that when they order what they think would be a full meal at home, what arrives at the table will be far more than they want to eat. Typically, a sandwich called a 'churrasco' or 'lomito' will come with about 1" thick scliced roasted or grilled meat on a 9" diameter bun. Seriously, you can't eat it without a steak knife and fork. Half-way through you have to ask for the 'doggie bag' (same term here). This photo doesn't do justice to the magnitude of the sandwich. A common dish here is 'lomo a la pobre', which, unlike the name implies, is not for the poor. It amounts to a huge slab of steak, 16 oz, 3/4 " thick, grilled. Over that they spoon caramelized onions. Then they pile on all they french fries it can possibly hold. On top of the fries are placed two fried eggs, sunny-side up. I think this is typical of the emphasis of meat in the diet. Missionaries eat almuerzo each day with members, and they all tell me that the meal always includes a large portion of meat. Another favorite dish in restaurants is the parrillada. We were introduced to this in Guatemala, but it seems to be more common here. A parrillada is a selection of various cuts of meat that are grilled over wood coals or charcoal. The ones I've seen have always included beef, chicken, pork, and chorizo (sausage). Sometimes it;s brought to your table on a large tray (usually ten or twelve pieces, so be prepared to share) and sometimes it's brought on a small hibachi-type grill with the hot coals still under it. Before we left Utah another Chileno told me: "Eat a completo for me!" I had no idea what he was talking about. A 'completo' is a Chilean hot dog. The franfurter is the same, and the bun is a little larger. But instead of adding mustard and calling it good, they put on chopped onions and tomatoes, than a liberal layer of guacamole. The whole thing is then laved in mayonnaise and served in a special holder. I guess that it's about as 'complete' as a hot dog gets. Or maybe it's named that because it makes up a complete meal by itself. Of course, it has to be eaten with a knife and fork. Like empanadas, they also can be bought anywhere. Here is a photo. I would say that, by far, the favorite vegetable in this country is corn. Not the dried and ground maiz of Mexico and Central America (you'll only find that in Doritos tortilla chips here), but wholly-ripened, boiled kernals of corn. Here they call it 'choclo'. It's grown in fat ears that produce fat kernals. They put it in almost everything: soups, drinks, salads, desserts, empanadas, and a concoction called 'pastel de choclo' (corn cake). Pastel de Choclo is a sort of shepherd's pie, with the obligatory meat, potatoes and corn, olives and boiled eggs, covered with a layer of corn meal, and baked. Chilean salads have taken a little getting used to. A large salad, or salad bar, is served at almuerzo. It is a selection of three or four coarsely sliced items such as cucumbers, tomatoes, lettuce, celery, onions, corn, green beans, etc. You take what you want and then put on a dressing. This can consist of ketchup, mustard, mayonnaise, vegetable oil, vinegar, and lemon juice. Lemon juice alone seems to be the favorite. Chilenos eat a lot more fresh-baked bread products, from the ubiquitous small panaderias (bakeries), than they do sliced and wrapped commercial varieties. Whenever we stop at one of the neighborhood bakeries, they are bustling with business. We buy a variety of fresh rolls, baguettes, and pastries and they are delicious. We have no problem getting rye bread here (the German influence). There is a large variety of other foods stocked in the largest grocery stores. Some of the things we can't get, however, are bagels, cheddar cheese, elbow macaroni, real ketchup, shortening, brown sugar and Miracle Whip. We manage to struggle by, however. There is a variety of international cuisine: Chinese, Japanese, Thai, Indian, German, African, Peruvian, and French. for starters. So far, I haven't found Mexican or Spanish. Where we live in Providencia we have no end of fine, relatively inexpensive, dining. Most of the restaurants offer a variety of dishes, many with rice or pasta, papas fritas o papas pures (potatoes, fried or pureed) or even baked potatoes. Lots of seafood dishes are always available. We enjoy the huge selection of fresh fruits and vegetables that are raised here. 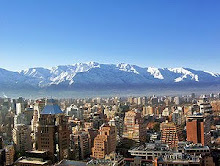 Chile's fruit export industry is vast and well-known. They are the largest exporter of table grapes, and the fifth largest exporter of wines. (We've sampled the grapes, but not the wines.) My guess is that in this, the strongest of all Latin American economies, it makes sense for Chile to use its arable land for producing crops for export rather than forage for livestock; hence, the importation of beef. Our friend Lucho was right: Santiago has lots of very nice areas for walking, and lots of very nice food. We are making use of both. I see that you were impressed by the food in Chile. Of course most of it is imported from Argentina since the Argentine meat is something amazig and incredibly tasty. I travelled to BA 2 years ago and once I was in my apartment in buenos aires and I ordered "empanadas". I liked them a lot together with Dulce de leche! Those food pictures are making my mouth water. I enjoy your blog very much. I talked to Verna about the missionaries that you know in, and coming to, your mission. Small world. God bless you. Married in 1968, with six children and twenty-four grandchildren (number 25 coming in Nov. 2013). I have two married grandchildren and one great grandchild. My husband passed away April 6, 2011 from cancer after we returned early from our mission in Chile. He was a retired family physician and I was a home care/hospice registered nurse. We lived in Fillmore, a small town in rural Central Utah from 1975 and we love it there. We served a mission together for the Church of Jesus Christ of Latter Day Saints to Guatemala. We served again in 2010 in Chile where Dave was the physician for the missionaries. I recently moved to my childhood home in Murray, Utah. I am currently serving another mission, this time in Fiji as the mission nurse.